While chances are high that Jerusalem’s many charms and awe-inspiring sights will have you wanting to stay as long as possible, a short visit can still be a memorable one. Only have 24 hours to see the city? Our local Jerusalem tour guides know exactly how you can experience the best this fascinating city has to offer. 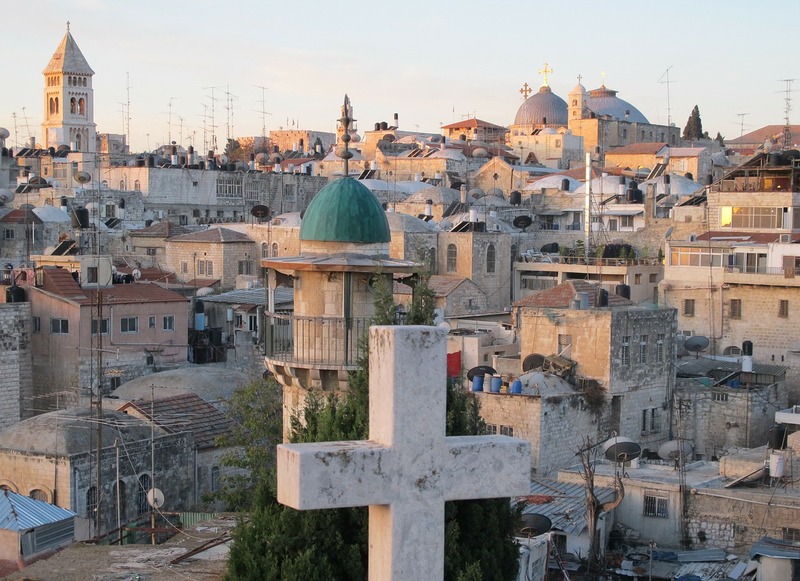 Start your whirlwind trip to Jerusalem in the Old City with a visit to the Church of the Holy Sepulchre. The earlier you go, the better since crowds get bigger as the morning wears on. This is one of Christianity’s most sacred sites and is said to be the site of the crucifixion, burial and resurrection of Jesus. There’s a lot to explore here and in the Christian Quarter (where you’ll find the Church of the Holy Sepulchre), so take your time. Next up, have breakfast at one of the many tiny hummus places hidden in the alleyways of the Old City, which usually start opening around 8:30am. 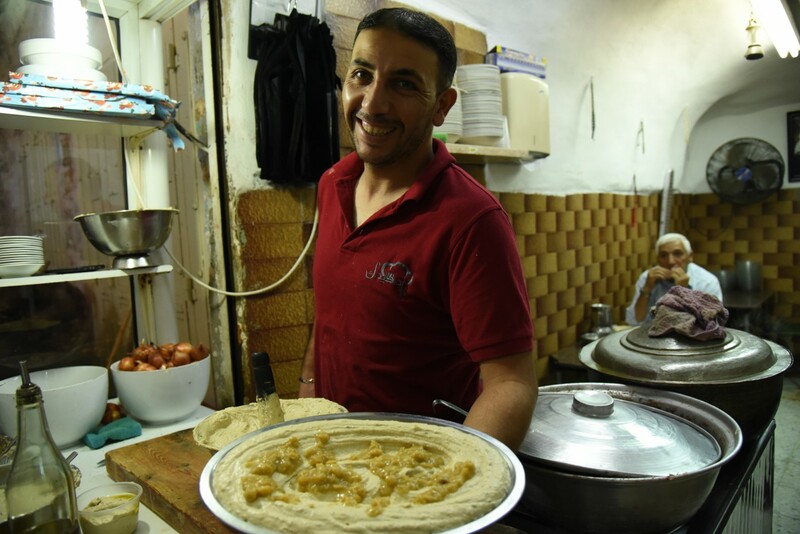 Keep your eye out for places with lots of locals and stop there — this way you’re guaranteed the best hummus in town. We recommend Hummus Lina close to the Christian Quarter, or Abu Shukri in the Muslim Quarter of the Old City. Make sure you have a good hearty meal to last you a few more hours of sightseeing, because once you start exploring, you won’t want to stop! Walking in the alleyways of the Old City before it gets busy is one fantastic experience, and something everyone should experience in Jerusalem. After breakfast, see the Old City from a whole new perspective — from above — with the Ramparts Walk. 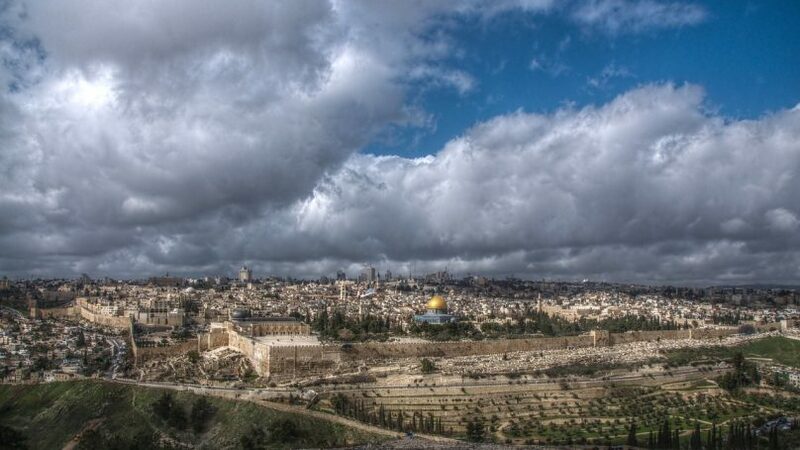 Divided into the north side walk and the south side walk, you’ll have a chance to walk along the walls of Jerusalem, getting a unique birds-eye view of the Old City. The north side walk is the longer of the two covering the area from the Jaffa Gate to the Lions Gate. The south side walk is shorter, beginning at the Tower of David and continuing around to the south side of the city, ending at the Western Wall. Walk to Jaffa Gate to purchase tickets at the tourist info centre and buy the full-wall ticket, which encompasses the northern and southern parts. Just keep in mind you have to return to the same spot in order to start the other part of the walk. When you’re starting to get hungry again, make your way to the Austrian Hospice for a cup of Viennese coffee and apple strudel, or schnitzel and a beer for lunch. Purchase a ticket to go up to the rooftop terrace for another scenic view of the city. Your other option for lunch is to make your way to Zalatimo Sweets for some authentic mutabbaq, of which they only make two kinds (thin pastry filled with either walnuts or cheese, then baked and sweetened with a bit of syrup). Zalatimo is a very old establishment (be warned: it’s dingy, but always busy), where the secret recipe has been passed down from fathers to sons over generations. Grab a seat at one of the plastic chairs and watch how your mutabbaq is made before digging in. (If you’re with a friend, grab two flavours and share!) Just note that it’s only open until 2pm Saturday through Thursday, and closed on Fridays. There are a lot of Zalatimo shops in Jerusalem, but this one is “the” place for mutabbaq and the original shop that opened in the 19th century. If you’re having trouble finding it, walk to Khan Al-Zeit in the Old City and ask for Zalatimo. People will show you around. And if you’re interested in learning more about Jerusalem’s diverse array of culinary goodies, our Tastes of the Old Town tour is perfect. In the afternoon, walk (about 25 minutes) to West Jerusalem and wander around, making sure you end up at the Machane Yehuda Market (also called the shuk), the largest market in Jerusalem and well worth a wander for the over 250 vendors selling heaps of locally grown and produced items, as well as handicrafts, spices, clothing and more. You can snack your way through the market with the Bite Card, which for NIS 105, gets you six tastings of authentic eats (from hummus to stuffed grape leaves) you can enjoy on your own time. Once you’ve had your fill, make your way to the Beer Bazaar right in the market, which offers 100 types of Israeli craft beer from microbreweries all over Israel. Just note that it doesn’t open until 7pm on Saturdays and closes at 4pm on Fridays. If you don’t get to Beer Bistro, there are plenty of other options. Bars are often tucked amidst market stalls so just keep your eyes peeled. Assuming your visit to the market was timed in order to make a stop at Beer Bazaar, stick around after your beer to watch the vendors close their shops and see the colourful artwork on their shutters come to life. While there are tons of places to eat in Jerusalem, we actually recommend staying right in the market for the remainder of the evening. The market now boasts really cool restaurants with lots of culinary options, so you’re bound to come across something to satisfy whatever cravings you’re having. Some good spots to put on your foodie hit list include Hatch for craft beer and artisanal sausages, Crave for gourmet takes on street food, gourmet bistro Machneyuda (owned by thee of Israel’s top chefs), or authentic Lebanese food courtesy of Manou Ba Shouk. For travellers on a short visit, we’d definitely recommend having a layover that will allow you to spend two hours in the city centre, and another three to four hours for travelling to and from the airport plus ensuring you’re back well within range for checking back in for your flight. Remember that all travellers out of Tel Aviv need to be at the airport three hours ahead of time for security reasons, so plan accordingly. The best way to get from the airport to the sites is by taking shuttle bus 485. The bus runs every hour, 24 hours a day, 6 days a week (excluding Shabbat). Pick-up at the airport is on the arrivals concourse of Terminal 3, which is the same level as the airport taxi stand. There is also a pickup from Terminal 1. The trip should take around an hour (give or take) and costs NIS 16. If you want to see Jerusalem in two hours in the morning or afternoon, make your way to the Old City for a whole host of historic, cultural and religious sights that will take your breath away. 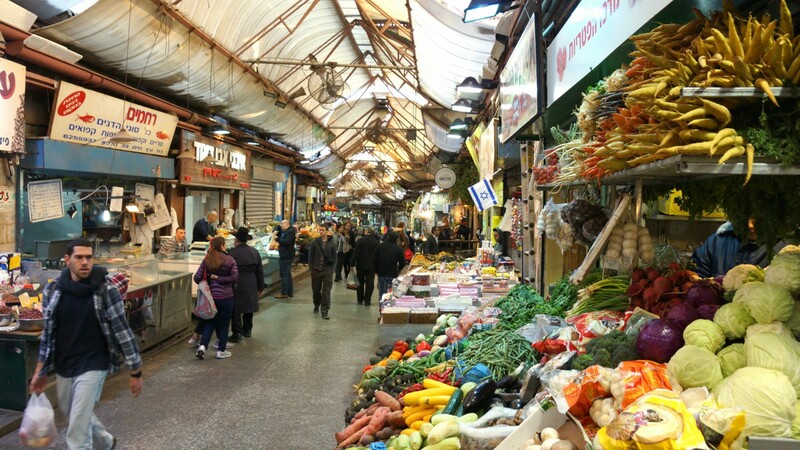 If you’re in Jerusalem for an evening or nighttime layover, head straight for Machane Yehuda Market. Even if you’re visiting after the stalls have closed up, there are plenty of bars and restaurants here to keep you busy and satiated before your flight out.